More than 200 youth rugby teams travelled to Butlins Minehead last bank holiday weekend for the final Tigers Challenge weekend of 2018. The two-day festival saw boys and girls teams from Under-7 to Under-14 age groups compete in the biggest youth rugby event of its kind. Tigers lock Harry Wells plus former Tigers Freddie Tuilagi and World cup winner Neil Back were on hand to present the winners trophies and pose for photos with each team. Two teams from our P7 year-group went on tour to take part in the Leicester Tigers Challenge. After playing qualifiers on Saturday both teams went on to play brilliant rugby and win their groups on the Sunday. 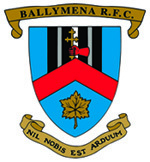 Both Ballymena teams came home with the trophies for their age group. Congratulations to all the players & coaches involved.